A big thanks to Herbert Kociemba for his Java implementation of the two-phase algorithm. Without this random-state scrambles for the 3x3x3 cube would not be possible. Thanks also to Jeremy Fleischman for his Java scrambler library which uses file-based lookup tables to save on load time. How do I start and stop the timer? Press and hold space. When it is released the timer will start. The timer will then stop when space, or any other alphanumeric key is pressed. How do I generate scrambles for other puzzles? 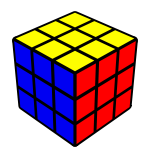 Click over the cube or scramble and select the puzzle from the popup menu. How do a change the orientation of the scrambled cube? Click over the cube or scramble and select the orientation from the popup menu. How do I set the time to a +2 penalty, DNF, or remove it altogether? How do I hide the tab contents? Click over the link for the currently selected (bold) tab. How do I remove times other than the most recent one? Click on the 'times' tab and then click over the time to remove. Does cTimer generate statistics on my times? Yes, click on the 'stats' tab. What does 'std' mean under statistics? Standard Deviation. It gives a measure of your consistency. In cTimer it is presented as a percentage of the average. Closer to 0% means your times are more consistent. How do I clear the time log? Click on any tab and click the 'reset' link in the top right. How can I see which times correspond to averages of 5, 12 etc? Click on the 'stats' tab and click on the table heading, for example 'best avg5'. This will highlight the times in the 'time' tab. Click on the 'overall avg' heading to un-highlight the average. How can I view my last scramble(s)? Click on the 'stats' tab and click on the 'overall avg' heading twice. This will display all scrambles and their corresponding times in a pop up window. How do I enable random-state scrambles? Random-state scrambles are enabled by default for the 2x2x2 cube and pyraminx. To enable random state scrambling for the 3x3x3 cube, click on the 'options' tab and set the 'Use 3x3x3 random-state scrambler' option to checked. If the java applet supplying the scrambles fails to load, it will revert back to normal mode (a sequence of 25 random moves). What does the 'breakdowns' tab do? It allows you to divide your solve into a number of stages, to get statistics on each sub-stage. How do I change the number of steps in my solve breakdown? How do I set the timer to count down my inspection time? Click on the 'options' tab and enter a value in seconds for inspection. Standard WCA inspection is 15 seconds. How does the inspection time feature work? Press space to start the inspection count down. When you have finished inspection, press space again to start the timer. Once the inspection time has passed a further 2 seconds is given. If inspection is completed within these 2 extra seconds a time penalty of 2 seconds will apply (denoted as a '+' symbol after the time). If the timer is not started after the inspection time plus 2 seconds, then the result is a DNF. How do I turn the inspection feature off? Click on the 'options' tab and set the inspection time to 0 sec. I noticed a bug in the program, how do I report it? Send an email to the author using this contact form. Please be sure to include a description of how to reproduce the error. I would like a feature to be added to the timer. Development of these features is subject to demand. If you would like to see any of these features, or you have another feature request please let me know. Thanks. Copyright © 2009-2014 Conrad Rider. All rights reserved.